The Electric Mr. Pea Sheller (Electric Pea Sheller Sr.) is big enough to handle home gardens yet small enough to fit in a closet. This pea sheller weighs less than 15 pounds and is only 16" long and 9" tall. 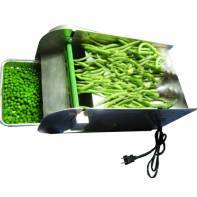 The Electric Mr. Pea Sheller is very simple to operate, simply spread the peas out in the slanted bin on top of the pea sheller. This slanted bed makes it easier to slide the peas in to the rollers. Once the peas reach the rollers they will be pulled through on their own. The peas will be deposited below the rollers in to a pan that comes with the machine (or your own pan that will fit in to the cubby hole). The pods will be ejected out the other end in a stack for easy clean up. The Electric Mr. Pea Sheller is designed to be operated by one person and comes fully assembled. Just take it out of the box, plug it in, and get the pea shelling! We are the runaway largest dealer for the Mr. Pea Sheller ( Pea Sheller Jr.) and Electric Mr. Pea Sheller (Electric Pea Sheller Sr.). We sell more shellers because we know more. We buy in large volume and we sell at great prices. More importantly, we offer great service with long hours of operation.